Once compounded by the pharmacy everything is shipped directly to you. You must be a current patient to access this product. To become one please fill out the Medical Intake Form for a wellness consultation. A proprietary blend of multiple ingredients that combine the power of B vitamins, nutrients, enzymes and amino acids to catalyze the metabolism of fat and carbohydrates in your body and fuel your weight loss for overall health. Ultra Lipotropic 10 supports liver and kidney function, heart health, bone strength, hormone levels and neurotransmitter function. 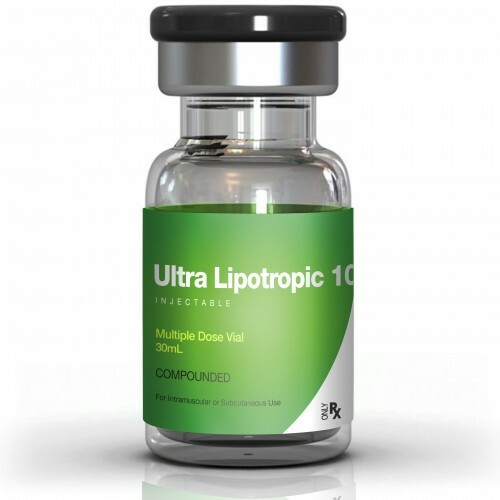 Our Ultra Lipotropic injections are the combination of Methionine Inositol Choline, L-Carnitine for weight loss and essential B vitamins including vitamin B12, B6, B1, B2 that enhances the natural metabolic processes of your body. Add the power of the ultra 10 cocktail to supplement your diet, workout and lifestyle to enhance fat burning and weight loss goals. Carnitine is essential for healthy living. Used to move blood sugar from the bloodstream into cells, control cholesterol and slow calcium loss in muscles. L-Carnitine for weight loss assists in digesting food and turns fats, carbohydrates and proteins into energy. Vitamin B6 is an essential component for the breakdown of fat in your body and works with other enzymes involved in metabolic functions such amino acid, glucose and lipid absorption as well as neurotransmitter synthesis.